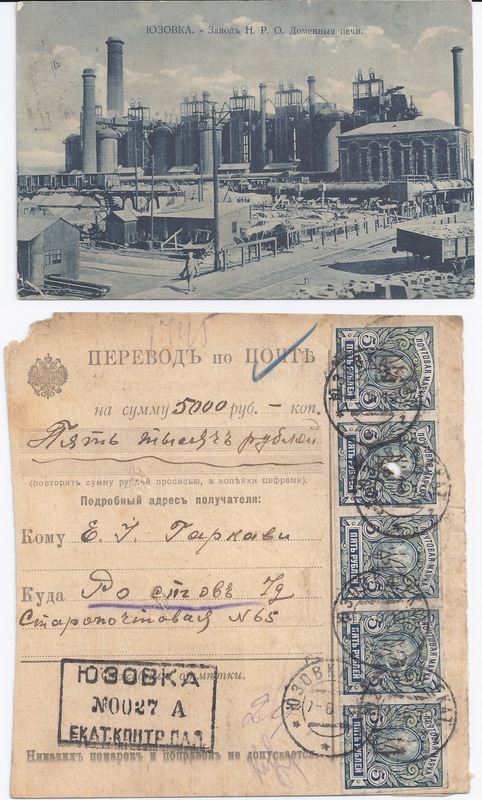 The postcard, sent in 1913, shows the Yuzovka Iron Works which in that year produced 74% of all Russian iron output . Yuzovka was a new town, dating from 1869, and it was basically created through the efforts of a Welsh engineer and businessman, John Hughes (1814 - 1889) after whom Yuzovka [ Hughes-ovka] was named. At the invitation of the Imperial government, he moved to Russia at the age of 55, travelling with eight ships and many Welsh workers. His first task was to supply iron cladding for the fortifications of Kronstadt. 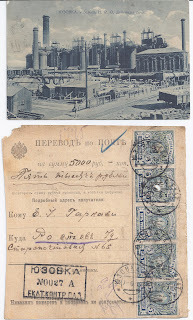 Hughes constructed the iron works, shown on the postcard, with eight blast furnaces; opened coal mines and iron ore fields; built a railway; and provided Yuzovka with an infrastructure of schools and hospitals. The Money Transfer Form was sent in June 1919 from Yuzovka, Katerinoslav guberniya to Rostov on Don. The 1% franking (front and back) is provided by imperforate 5 rouble stamps overprinted with Kharkiv II Tridents. At this date, Yuzovka was (I think) under the control of the Volunteer Army. Yuzovka continued to grow from the 1920s. Between 1924 and 1961 it was known as Stalino and is now Donetsk, a city of one million at the centre of the Donbas region. (To see a Stalino - related item, click on the label "Donetsk" below). I have relied on the short Wikipedia entry for John Hughes (businessman) - it is very interesting. Both the items shown above are for sale. Dr JDKeith Palmer of Virginia 2013. I was 17 when introduced to Mrs Hughes, aged 85, She was living in Uplands, Swansea when I met her in 1940 to teach me some Russian language and experiences. She was the widow of John Hughes of Yuzovka. She described her life as the young second wife of John Hughes emigrating from Swansea to the Ukraine in the early 1800s to live in the city named after her new husband. The Russian she taught me causes smiles when I use it to modern Russians, as it is a century out of date, rather like a person now speaking in Victorian English.